On Tuesday 14 June there are 6 pigeons basketed for the second overnight flight from this year. This team consists of old birds of 2 years and older . These are all on nest of about 5 (a) 6 days boy . and 1st St Vincent VCCC!!!!!!!!!!!!!!! Harold Zaidi Den Ham wins the VCCC/and NPO competition St Vincent Afd 9 and zone 3 of the NOW!!! 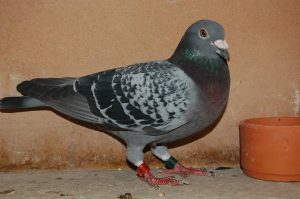 Of the 6 basketted pigeons play there 4 on the national result in Sector 3 4e , 248e ,, 388e and,811e A top result! But this was the weekend is not over! A full count on PAU ZLU with 4 top prizes. Likewise there on Pau made a great result. Of the 4 entered play there 4 price and all that on a flight of about 150 km and at a distance of 1138 km the first pigeon arrived at 07.17 in the morning and the 4th and last pigeon 08.51 hours!!! The 4 pigeons know all to classify at the first 300 National against 3788 pigeons and how. He plays 85,142,192 and 292! All prices so more than 1 10! 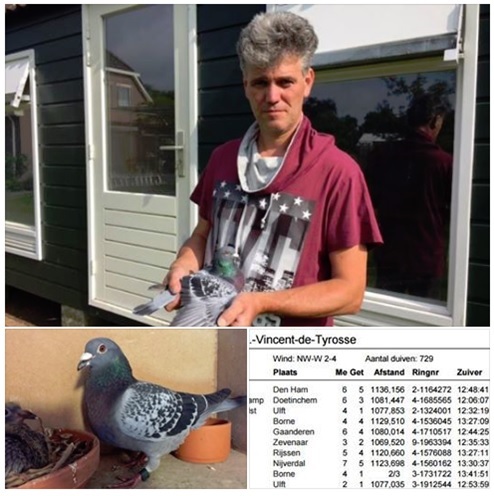 The first pigeon to 07.17 and 88th ZlU is a daughter of Benjamin ( son breeding couple 1336 Diana x ) x daughter black gold Jelle Jellema 09-882!! Here, too, picks up the culture together with Jacob fine!